A gang of at least seven looters struck at some houses in Guru Teg Bahadur Nagar and Dashmesh Nagar and took away cash and jewellery and wounded several persons last night. Out of the wounded seven persons have been referred to the PGI, Chandigarh. According to information, the looters first struck at the residence of Mr Kashmir Singh and wounded him, his wife Mrs Baljeet Kaur and their daughter Harpreet Kaur. Both husband and wife were seriously hurt and had been sent to the PGI. They looted some cash from their house. After this, the looters broke into the house of Mr Rajinder Singh. He told this reporter that the looters were at least seven in number and many of them had covered their faces. He suspected them to be migrants from UP or Bihar. The rod-wielding miscreants looted Rs 2,300 from them. Before leaving the house, they tied their hands and locked them in a room. The looters then tried to force into the house of Mr Avtar Singh and in the process wounded his wife, who has been sent to the PGI. Mr Avtar Singh said his daughter raised an alarm following which the looters fled. They again struck at the residence of Mr Anil Sood and wounded him and his wife. They also beatup their neighbour, who had come to help them. The three have been admitted to the PGI. According to information, the looters took away cash and jewellery from their houses. In another house in Swaraj Nagar, Rs 35,000 in cash and jewellery was looted. The residents were in a state of shock and were demanding police patrol during nights. They also criticised the Municipal committee for not providing street light and concrete roads in the area. Meanwhile, Mr Jaspal Singh Dhanoa, SP (D) Ropar, while talking to The Tribune said the police had rounded up around 100 persons in this connection. He said the police reached the spot immediately after getting the information and sniffer dogs were brought and fingerprints were taken. He said the police had raided many places and hoped to arrest the culprits soon. In less than a week after a decision was taken by the UT Education Department to extend the mid-day meal scheme to all 107 government and aided schools in the city, the Food Craft Institute in Sector 42 is working out modalities to provide packed food to 45,000-odd students. Some of the ingredients would be provided by the UT Administration. The Food Craft Institute, run by the UT Administration, was reportedly contacted by the Administration officials following directions by the Supreme Court while taking up a public interest litigation. The apex court, according to sources, had asked all government and aided schools to introduce the scheme up to the primary level all over the country. The Ministry of Human Resource Development has, however, refused to provide additional funds for extending the scheme following which a decision has been taken by the UT Education Department to generate its own funds. The funds will be generated from internal resources for meeting additional expenditure. Sources said that additional funds were required as under the scheme over 45,000 students were to be provided with free mid-day meal for 200 days, instead of 25,000 students who were being provided the same for 180 days. A senior officer in the Education Department, when contacted, said the Ministry of Human Resource and Development’s failure to provide additional funds was not a deterrent. Unutilised funds of the department would be diverted to meet the additional expenditure, he explained. He said as of now 40 urban Hindi schools were being provided with protein-rich bread which met the standards specified by the court. The City Administration achieved 85 to 90 per cent of its target of administering polio vaccine to the 1,20,000 below five years of age population of the city on the first day of the three-day Pulse Polio campaign which started in the city here today. More than one lakh children were vaccinated in different parts of the city by a total team of 1,700 health workers involved in the campaign. The total number of children vaccinated today is almost the same as the number vaccinated on the first day of the last campaign on December 2, 2001. As many as 28,784 children from 0-5 years were administered polio vaccine on the second phase of Pulse Polio eradication drive, here today. Dr Ram Kumar, SMO, informed that total 136 teams of Health Department employees were pressed to service of which 115 teams visited rural and 11 urban areas of the township. To yield more results, the department had also formed 10 mobile teams. As many as 55,000 children below the age of 5 years were administered polio drops here today as part of the first day of Pulse Polio campaign. The campaign began with the Deputy Commissioner, Ms Jyoti Arora, administering polio drops to a child in Sector 12-A dispensary. The residents had been requested to get every child between the age of 0-5 years to one of these booths and get a dose of oral polio vaccine. ‘‘The aim is to have an environment for a period of at least three days in which the polio virus cannot hold on and even if a single child remains non-vaccinated during this period the chain breaks and the virus is not eradicated,” said Dr B.S. Chaudhary, Civil Surgeon. Of the total booths set up in the district, 50 were set up in the urban parts. As many as 14 mobile booths were also set up. The campaign has been intensified since a polio case was reported in Rajiv Colony in the month of November. Dr Chaudhary informed that the house-to-house campaign would begin tomorrow and remaining 6000 children in the district, who had not been administered the vaccine, would be administered the same during the next two days. As many as 2.5 lakh children were immunised for polio by administration of polio drops under the Pulse Polio campaign in the district today. The Civil Surgeon, Dr Inderjit Kaur Walia inaugurated the drive in the city at the Dhiru ki Majri slum area in the city by administering the first dose of polio drops to her grand daughter Suhani. Camps were also organised at the bus stand, railway station and other public places. Dr Walia said 37 mobile teams immunised children on all main roads with police nakas being specially organised on all roads to ensure that no child was left unimmunised. She said 1,100 booths had been set up for the purpose with the help of 215 supervisors. Meanwhile the mobile unit of the Ranbaxy Community Health Care Society went around the city slums and immunised 1800 children today. Unit in charge Dr S P Singh said the team, which was supported by a team of 25 volunteers, including students of the Department of Social Work of Punjabi University, went around the entire city to locate children who had been left uncovered by the ongoing immunisation drive. As many as 1,45,000 children up to five years of age were administered polio drops under the Pulse Polio Immunisation Campaign in Ropar district. In SAS Nagar, at least 7,000 children were given the polio drops as against the target of 10,000 children at 43 posts, being coordinated by the Civil Hospital in Phase 6 here. The Rotary Club and other NGOs took part in the immunisation drive. The Ranbaxy Community Healthcare Society immunised 1,025 children at two posts. More than anything else, countries are identified by their architecture. Pyramids in Egypt, Glass Pyramid outside Louvre and Eiffel Tower in Paris, Statue of Liberty in New York, Petronas twin towers in Malaysia, Great Wall of China, Sydney Opera House in Australia, Colloseum of Rome, Italy and Taj Mahal, India. Chandigarh is among the most modern city of the 20th century designed by one of the greatest architects of the last century, Le Corbusier. Therefore, Chandigarh can be and should be projected as a stand-alone tourist destination. But somehow, it has not been projected worldwide in the manner it should have been, says Mr M.N.Sharma, a former Chief Architect of Chandigarh, who was associated with Le Corbusier in the execution of the Capitol Project. Chandigarh continues to attract students and scholars alike from world over. But these are the intellectual types. General public is more aware of the Rock Garden due to world-wide publicity given to it. “Mind you, I have no problem with that...after all Rock Garden is a great work of art in its own way. But I wish Chandigarh as a whole, especially the works of Le Corbusier, are projected throughout the world in the manner they deserve”, he says. Isn’t it ironic that even the citizens of Chandigarh are not fully aware of the importance of these great, awe-inspiring monuments. It was amazing to hear from a CITCO official the other day that Chandigarh had lost its importance as an architectural marvel because so many clones have come up all around it. If it is Panchkula in the East, it is SAS Nagar in the South West. Even NOIDA and Gurgaon look like Chandigarh, he asserted. But what he is apparently unaware of is that the monuments of great modern historical value designed by Le Corbusier for the Capitol Complex are unique in the world. These include the High Court, the assembly and the secretariat which unfortunately have not been given adequate publicity. These edifices are more important than Sydney Opera House in Australia or Glass Pyramid outside the Louvre in Paris which have been designed by the admirers and disciples of Le Corbusier and advertised as great tourist attractions by those countries. The Capitol Complex these days gives the appearance of a “war zone” with formidable barricades all around manned by gun-toting security men. “We do need to protect the dignitaries and our buildings in the prevailing conditions but effective, unobtrusive measures can be devised and surveillance made very effective by adopting sophisticated measures as they have done at 10 Downing Street in London. Despite all security the British Prime Minister has, tourists still manage to go there and take a peek at his official residence...”, Mr Sharma points out. Besides, Chandigarh has one of the finest Rose Gardens in the world and more modern classical buildings than any other part of the world. But unfortunately, even good picture postcards on Chandigarh are hard to come by. Nor are there any worthwhile curio shops. CITCO has been doing its bit in its own way to attract tourists to City Beautiful. The number of tourists who visited the city increased from approximately 2,58,000 in 1990 including around 6,200 international tourists to almost 4,50,000 in 1999 (around 11,500 foreign tourists). “The city is considered as a gateway to Punjab and Himachal Pradesh and a good amount of revenue inflow can be attributed to this”, says Mr S.P. Singh, Managing Director, Chandigarh Industrial and Tourism Development Corporation (CITCO). Send SMS messages in mother-tongue ! Conveying sentiments to your loved ones is going to have an authentic touch, with expressions in your mothertongue or in the national language in the SMS facility, a recent introduction by the Spice Telecom. From wishes on special occasions to utility messages — there is a list of 40-odd messages in Hindi and Punjabi which the company has on its website www.spiceindia.com that can be sent. “To begin with, our subscribers have the option of choosing a message from the list of messages. Shortly, we will also introduce the facility where they will be able to frame the messages and send any message in Devnagari or Gurmukhi,” said Mr Dheeraj Aggarwal, Head,Value-Added Services Division, Spice. A subscriber, in order to send an SMS from the list of messages, will need to mention the logo number of the message on the website, following which the message will be sent. Spice has created a special software for the purpose. “Handsets here are not compatible to Devnagari script, so we created special software for this service which can be used on all kinds of cellular handsets,” said Mr Aggarwal. The list includes messages in chaste Punjabi like chak de phatte, balle balle to more sober ones like waheguru tera aasra, messages in Hindi like shubh labh, Holi hai, shri Ganeshay namah, birthday wishes and many others. There also are utility messages like der ho jayegi where one has the option to fill in the time he wants to and fun messages like aaja nachh le. “The list will be regularly updated with additions on occasions like Republic Day and others”, said Mr Aggarwal. With the launch of this value-added service, Spice expects to bridge the gap between the urban and the rural users and also add more subscribers to its list. The present number of messages sent via SMS in a day ranges between 2 lakh to 2.5 lakh. “It is also expected to increase the SMS usage manifold as now anyone will be able to use it and the messages will have more personal touch when they in your own language", he said. No move has been initiated by Panjab University to appoint more than one paper-setter for the annual examinations, despite a recommendation by a committee and agreement in principle by the Syndicate more than three years ago in this regard. For the forthcoming annual examinations this year, the university has availed of the services of only one paper-setter who sets three papers each for a single paper. The problem of paper leakage has arisen more than a couple of times in the recent years, with the blame game between the teachers on the one hand and the examination branch on the other. It has been pointed out that there are more chances of leakage in case of only one person setting all papers. To ensure ‘foolproof secrecy and fix more responsibility’ it was agreed by the Syndicate that there should be three paper-setters who should set two papers each. This would increase the availability of the papers with the examination branch and secrecy could be better maintained. The matter was referred to a special committee. The financial committee faced by the university in appointing more paper-setters was pointed out. The committee agreed that there should be at least two paper-setters. The Controller of Examination would have the responsibility to choose the paper to be finally set. At present there is only one paper-setter. One paper is given to students in April and another during the September supplementary examinations. In case of Environment Studies paper when another exam had to be conducted in the recent past, the university had to give even the third paper to the same paper-setter. A Senior Fellow said the university was flouting its own recommendations which was a “sad”. The only aim of the recommendation was to make people more accountable and ensure greater secrecy to sustain the credibility of the examination. Highly placed sources in the examination branch said ‘even this time the university has only one paper-setter setting three papers.” “Having more than one paper-setter is undoubtedly in the academic interest of the university in order to lend more credibility to the examination system. The university, however, is not in a very comfortable financial situation which is one of the major reasons for carrying on with the old practice”, sources said. NOTHING seems to have drawn so much flak for the Chandigarh Administration as its idea of introducing property tax and enforcing the minimum electricity charges in the city. The local M.P., Mr Pawan Bansal, was among those who flayed the administration for levying property tax. He said the administration was at times not able to use the funds released to it by the Union Government. There are several instances when the Administration had to return the money to the Centre for its inability to use the funds. Mr Bansal said people of the city would not mind paying any property tax, if warranted by circumstances. The best course , he said, would be that the administration prepares a white paper about its income and expenditure. The administration, perhaps, does not know that the Chandigarh Circle of the Income Tax has recorded that it is the highest income tax paying circle in the country. If the administration introduced property tax, all Congress Councillors would oppose it tooth and nail. The action of the administration enforcing minimum electricity charges has also been flayed by one and all. This decision is contradictory in itself. On the one hand the administration has appealed to the public to conserve as much power as possible; on the other it is sending the minimum electricity bills to the people. Why will people bother to conserve electricity, if they have to pay through their nose? Will the Administration reply to this query of people? Nek Chand’s Rock Garden has grown so much in reputation that a visit to it is an invariable part of every visiting dignitary’s itinerary. Over the past fortnight two highly placed officials of the United Kingdom visited the Rock Garden — the Queen’s Counsel Baroness Helena Kennedy and the Deputy Director of British Council Dr Morna Nance. The visiting British officers have been so impressed with Nek Chand’s environmental sculptures that about six of them are already adorning the entrance to the British Library in Sector 8. Once an armyman always an armyman. This phrase fits the most on the head of Punjab Governor and UT Administrator, Lieut Gen J.F.R. Jacob (retd). For three days, the Governor went to forward areas in Ferozepore, Gurdaspur and Amritsar. And all this just to boost the morale of the troops in the freezing winter along the Indo-Pakistan border. The Governor, who was part of the core group which masterminded the famous surrender at Dhaka in 1971 war with Pakistan, celebrated Lohri in Dera Baba Nanak with the jawans, distributed peanuts, rewris and til bhugga. Later, the General shared food with them on the barakhana. He ate the same food in the same utensils, no Guv like airs of bone china plates or special arrangements. On his previous visits to the border also the Guv was keen on visiting the jawans and also went to Hussainiwala located smack on the border. Being a armyman he talked and talked with jawans who just loved the adulation in a language, the language of the brave, which they understand. He also had a quiet word with the General Officer Commanding-in- Chief (GOC-in-C), Western Com-mand, Lieut Gen Surjit Singh. The visit helped in boosting the morale of troops more than what could have been the possible impact of a visit by a politician. Actually, the Governor has always been a man of the jawans. The Chandigarh Municipal Corpor-ation now has a new Chief Engineer. A panel selected Mr V.K. Bhardwaj, Superintending Engi-neer, Construction wing of the Chandigarh Administration, to head the engineering wing of the MC. Besides his record as engineer the other love of Mr Bhardwaj is cricket. And not of the armchair variety. At 52 Mr Bhardwaj still plays active club cricket and desires to be in the thick of action. He is also the Vice- President of the Union Territory Cricket Association (UTCA). On the engineering front the city remembers him for his work carried out when on deputation to the PGI. It was under his supervision that the Advanced Paediatric Centre, the new emergency and the new OPD (out patients department) blocks were built. Lately, he was given the task of building the Government Medical College and Hospital (GMCH), Sector 32. It is a natural phenomenon that when one retires or is transferred from one place to another, one’s colleagues and subordinates take stock of one’s merits and demerits. It is not surprising that when Mrs Nirmal Yadav, Sessions Judge from the Haryana cadre who held the post of Registrar of the Punjab and Haryana High Court until last week, sought her transfer to a district, her colleagues and officials of the High Court are discussing her virtues and style of functioning. During her stay as Registrar of the High Court for a little less than two years, she had endeared herself to one and all because of her compassion for her subordinates and respect for her superiors.. Most of the officials feel that Mrs Yadav had the courage to call a spade a spade at the face of those who mattered.. No wonder she protected certain employees who would have otherwise been punished because of no fault of theirs. They felt unhappy when she decided to go to a district as Sessions Judge . Advocates would also remember her for getting a Counselling Centre set up at the High Court, The Chief Justice of India had come to this High Court to inaugurate this centre This centre was aimed at settling matrimonial disputes and to bring out reconciliation between spouses. A large number of cases were decided by this centre at the pre-litigative stage and saved couples from falling apart . The obvious questions that people would like to ask is why did she choose to go to a district? Some of the officials of the High Court feel that she used to come to the High Court at 9 a.m. and her working hours continued till 8 p.m. Moreover, her husband is settled at Gurgaon. Therefore, she had little time to devote to her family members or her relatives who happened to visit Chandigarh. Officials feel that she is a senior Sessions Judge and would be elevated to the High Court Bench after some time and they would get an opportunity to work with her again. As one senior official remarked, it was a privilege to work with her. She usually never lost her tamper. At worst she used to tell for subordinates that one should work with responsibility and devotion. Amidst loud protests by different sections of society, including the Sector 17 Traders Association, the Chandigarh Municipal Corporation has introduced paid parking in the city with Councillors of non-Congress political parties blaming the ruling group of burdening the people with recurring monthly expenditure. Congress Councillors feel that people would not have lodged protests if the paid parking had been introduced in a phased manner. No wonder they point out several flaws in the paid parking which the corporation should remove. First, as its name suggests, the parking fee should be charged only if a vehicle is parked at a parking lot. However, attendents of parking lots demand parking fee even if a driver has come to drop a person at any of the markets where paid parking fee is introduced. Their argument is that if the vehicle has not been parked and the driver goes back immediately after dropping the person, the parking fee should not be charged. What the attendents do not understand is that it is not entry fee but only parking fee, if a vehicle is parked. Second, parking fee inconveniences students who come to the Sector 17 market for eating icecream or for buying books. They do not park their vehicle at any place beyond a few minutes. There is little justification for penalising students with parking fee. After all they have to depend upon their parents for every penny. The third argument that Congress Councillors put forward is that contractors should issue monthly passes to vehicle owners for all parking lots. It is wrong that different contractors in different markets should charge different parking fee from a vehicle owner. If a person has to visit all the three markets, he would be required to pay parking fee at three places. It will certain pinch him. Mr Satya Pal, who addressed media persons on behalf of parking contractors a day before the paid parking was introduced in the city, had said that contractors would happily consider all suggestions received from the public and would try to redresses of the public, as far as possible. A small hoarding installed by the Municipal Corporation in Sector 34 market area, being dug up for laying water pipes reads in bold letters: COUTION! Demanding the revival of public sector banks, the Bank of India Officers' Association has said that the government needs to infuse additional capital and also introduce legal reforms in order to recover non-performing assets (NPAs). In it’s 15th annual general meeting organised by the association (North-West region), which was attended by around 400 bank employees from Punjab, Haryana, Himachal Pradesh, J&K and Chandigarh, the problems being faced by the banking industry were discussed. Condemning the move to introduce voluntary retirement scheme, Mr V. Eswaran, general secretary, Federation of Bank of India Officers Association, said, “Reduction of work force in the name of VRS resulted in nearly one lakh experienced officers and employees from other positions leaving the banking industry, which would prove detrimental to the sector”. Emphasising on the need to cut down NPAs, the members alleged inaction by the government. “NPAs of the banking industry have reached more than Rs 63,000 crore, but no legal reforms have been contemplated by the government to recover dues from big industrialists. The meeting also opposed privatisation, closure of bank branches, creation of asset reconstruction companies and retrenchment of manpower in any form. They also demanded default of bank loans to be treated as a criminal offense. Mr M.L. Digra, president of the association, Mr S.N. Sood, Zonal Manager, Bank of India (Chandigarh zone), Mr Ashok Sharma, general secretary of the association, and Mr H.S. Bhatia, Zonal Manager (Ludhiana zone) also attended the meeting. A two-day conference of the Hindustan Scouts and Guides from various northern states concluded here today, with Additional Deputy Commissioner, Panchkula, Mr S.K. Goel, being nominated as Headquarter Commissioner of the local chapter of the Hindustan Scouts and Guides. Speaking on the occasion, Mr Goel exhorted the members to spread the message of scouts and guides and play a positive role in nation building, specially in the rural pockets. He said the youth in the country needed to be taught the values of discipline and scouts and guides could play a positive role in this. The conference, which began here yesterday, had been inaugurated by the City Magistrate, Mr Rajesh Jogpal. Mr. Kanwar Babu Singh, Chairman of the Haryana unit of Scouts and Guides, while giving details of their activities said they were involved in teaching forestry, camping and scouting, life saving techniques, cooking, sending signals etc. As many as 50 office-bearers of Scouts and Guides participated in the seminar. The Hindustan Scouts and Guides is operational in 25 states in the country. The Chandigarh chapter was also reconstituted yesterday and the office-bearers headed by Mr Ramesh Mittal as vice-president, Mr Ajay Chaube as general secretary and Mr Ravinder Pathania as joint secretary were selected. It was also announced that the four-day national conference of the Hindustan Scouts and Guides would be held in Bangalore from February 28. Even though the Chandigarh police has reportedly expressed unhappiness over the quality of horses purchased from the Army earlier, it is procuring another eight horses to boost up its mounted strength. Presently, the local police has 32 horses, out of which four are expected to be relieved soon. According to police sources, the horses, to be brought in from the Army breeding centre in Saharanpur or Hempur, are expected to cost around Rs 95,000 each and would be fully trained. They would be 4-6 years old. Out of the present 32 horses with the local police, two are difficult to ride as they do not permit anyone, other than their handlers, to ride them. One is aging while another 10-year-old horse is suffering from a skin disease. The Chandigarh police has been using horses for patrolling, riot control during public demonstrations as well as on ceremonial occasions and parades. The force has a strength of about 40 riders led by an assistant sub inspector. Six horses are attached to the Mani Majra police station, while the Sector 39 and Sector 34 police stations have three and four horses, respectively, at their disposal. The remaining horses are attached to the Police Lines, Sector 26. The police had bought 10 horses in 1998 for Rs 72,000 each, while 10 had been procured in 1996 for Rs 39,000 each. Police sources say that some of the horses supplied by the Army have not been up to the mark as those not wanted by the Army for not measuring up to the requisite standards were passed on to the police. One of the horses had to be auctioned off recently for a mere Rs 7,500. In addition to green grass, each horse is provided 3 kg of fodder, 1.5 kg bran, 1 kg black gram, 1 kg barley, besides an assortment of oil, jaggery, salt, alsi and kali cheeri. The horses are also required to undergo a medical check-up once a week. Despite the expenses involved in maintaining the mounted establishment, its utility has been little. Rarely is the mounted police seen patrolling on city streets. There have been instances in the past when they were brought out for patrolling in certain areas for short stints, but the moves later fizzled out. The Congress has indicated its willingness to accommodate two or three members from amongst the seven-member BJP, CVM, SAD group and nine-member group of nominated councillors in the January 28 Finance and Contract Committee (F&CC) election. “The party has authorised the local MP, Pawan Bansal, to decide its candidates for the committee. One person from the BJP-SAD and the CVM combine can be considered. One may be two can be from among nominated members,” Congress leader in the House, Mr Subhash Chawla told Chandigarh Tribune. The Congress offer is an attempt to display its sagacity in contrast with that of the BJP in the last House. It is also an effort to divide each of these individual groups and fire into them an ambition to be elected to the committee. The Municipal Corporation secretary, Mr Ashwani Kumar, notified the election after a decision last evening. The last date of nomination had been fixed for the afternoon of January 28. The election would be held at 10 am on January 28. The Congress is also likely to bring a resolution in the first meeting of the House on January 28 to restore powers of the Mayor to nominate members of other 11 committees. The nomination rights were taken back by the BJP-dominated House from the minority Congress Mayor, Mr Raj Kumar Goel. The Mohali league of ex-servicemen of SAS Nagar and surrounding villages has formed a committee to study the election manifestoes of different political parties and candidates so that the ex-servicemen could vote collectively in elections. They were critical as no political party had ever included welfare of the community in their election manifesto. The league has adopted a new motto ‘Soldiers fight for the country and veterans fight for the soldiers’. The issue of voting right of soldiers at their place of posting was also raised at the meeting. This issue was expected to come up at a meeting of the Punjab Human Rights Commission on January 25. The Mohali league members urged all former defense personnel to look for the welfare measures for the soldiers and ex-servicemen in the election manifesto of political party before voting. The league also demanded restoration of ex-servicemen’s job quota in the Punjab Government to erstwhile level of 22 per cent, reconstitution of a ‘monitoring cell’ for roaster checking and sponsoring of the ex-servicemen vacancies. The league also demanded that properties of defense personnel and ex-servicemen should be treated under the same law as applicable to those of NRIs, allotment of land to war widows, who till date, had not been been given land and sainik institutes for all ranks as that at DSOI, Chandigarh. Brig H S Ghuman (retd) of the league said that the Punjab Government had made an ‘unauthorised’ collection of more than Rs 50 crore as octroi on CSD canteens and had shown its inability to return it to the defense authorities. The committee members include chairman — Col (retd) J.S Rai, spokesman — Brig(retd) H S Ghuman and members — MWO H.S Sandhu, Cpl J.S Kumbra (retd) and Lt Col Angad Singh (retd). Nailing down the ruling Akali Dal over the death of two Dalit children in Siau village, corruption in politics and revival of sick industrial units in the town would be main issues of the Panthic Morcha candidate from the Kharar seat, Mr Rajbir Singh Padiala. Mr Padiala, son of the sitting MLA from Kharar, was speaking at a function to inaugurate the election office of the Panthic Morcha in Phase 7 here today. He said his opponents were afraid of his popularity and were indulging in unethical practises. He was lodging a complaint with the Election Commission on the tearing of posters and banners by his opponents. Earlier, the leader of the Sarb Hind Shiromani Akali Dal, Mr Gurcharan Singh Tohra said the SYL issue would be the main election issues. Hitting at the Mr Parkash Singh Badal for not fulfilling the promises he had made in the 1997 election manifesto, Mr Tohra said he ( Mr Badal) had not sought the list of assets of his MLA’s in the past five years. The Panthic Morcha leader said the Chief Minister had challanged the existence of the supreme temporal seat of the Sikhs. Law and order in the state was last on the priority list of the ruling Akali Dal government. He pledged support to the protesting employees Punwire. The Punjab Governor, Lieut Gen. J.F.R. Jacob, PVSM (retd. ), today called upon the people to spread the message of universal brotherhood and inter-religion harmony as propagated by Guru Gobind Singh, to every part of the country. Felicitating the people on the eve of the birth anniversary of the tenth Guru, the Governor said Guru Gobind Singh was a champion for the rights of down-trodden and an all-sacrificing martyr for the cause of persecuted humanity who fought against oppression, injustice and tyranny throughout his life. MANSIJ Bhan is a name which will ring a bell in the minds of those who attended one of the mega information technology events of last year — Lakshya 2001 — at the DAV College, Sector 10. Doing his last year of Bachelors in Business Administration at the college, Mansij wants to make it big in life in public relations. A keen squash player, Mansij has been representing his college in the game. ‘‘But now it is all studies. I have just sat for CAT examination and intend to do MBA.’’ he says. Event management remains his first love and he feels that if given an opportunity, he will try and do a better job of what he and his team were able to manage at Lakshya 2001. Busy trying to make a career in Business Administration, Mansij has decided to take up human resource and development in his MBA. “I used to be a very different person in school than what I am now. Now I believe that with hard work, one can achieve anything in life. But this is not what I thought earlier and I know that at a very young age one does not believe in hard work but more in being at the right time at right place. The Panchkula and Mani Majra Property Dealers Association has demanded that the system of haziri after getting the registration of a plot of land in the district be done away with. Addressing a press conference here today, Mr Roshan Lal Singhal, president and Mr Ashok Kumar Verma, adviser of the association, said the system of being present for attendance after the registration of land deed was unique to Panchkula. “This system is not even being followed in other urban estates under the office of the Panchkula Administrator, HUDA, and is not part of the rules framed by HUDA for transfer of property. It causes a lot of inconvenience to buyers, sellers and middlemen like us and should be abolished,” they said. They also said that the registration of plots in Panchkula Extension (Sectors 25 and 26 ) should not be through sale deed in the wake of the enhancement in rates. Office-bearers of the association were elected today. Mr Randhir Malik has been elected chief patron, Dr D.R. Bhatia patron, Mr M.R. Sethi, senior vice-president, Mr Jag Bhushan general secretary and Mr Raju Aggarwal treasurer. A USA-based website hosting company, www.i2k2sytems.com, today organised a seminar and training on complete Internet awareness here. The support and technology being introduced by i2k2 systems in Chandigarh was highlighted. Hosting with immense supports and services starting on Windows 2000 and NT were introduced. These services would be provided on EXODUS Data Center. Mr Rahul Aggarwal, director, i2k2 Systems, reaffirmed in his presentation that Chandigarh would now be able to avail of world-class services. Mr Naveen Gupta, director of the host academy, sponsored the seminar. Residents of Sector 46-C this morning went without water supply due to a snag in the sector supply line. They were provided with water in the evening through six tankers sent by the Municipal Corporation. Officials said they came to know of the leakage in the waterline early this morning and immediately deployed staff for repairing the line near the 46-C rehri market. They said tomorrow’s morning supply would be normal. 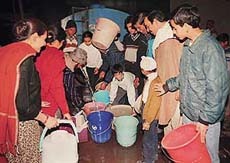 Queues of women, men and children were seen in the sector with buckets in hands. Popular TV Star Jaspal Bhatti had a narrow escape when a truck rammed into his car while he was on his way home from Mohali on Thursday night. Talking to TNS, Bhatti said the incident occurred at the Sector 44-45 barrier on the road leading to the Cricket Stadium while he was driving home at about 1 a.m. He said the truck hit the rear portion of his Matiz car, which has been badly damaged. Bhatti said he has decided not to register a case with the police in this regard. A three-year-old female Hog deer died due to prolonged illness at Mahendra Chaudhary Zoological Park here this afternoon. Sources said that animal had sustained injuries in a fight some days ago. The animal was found dead in its enclosure at about 3 pm. The carcass was buried after postmortem examination. In a bizzare incident, the nose of a woman residing in Pir Colony in Sector 56 was reportedly bitten off by another woman following a dispute. The injured woman, identified as Nikhilesh Kumari, has been admitted to the PGI. The victim had approached Gurcharan Singh, a resident of the same colony, to get money she had won in a kitty. Based on a complaint filed by a sector 22 resident, Mr Karam Singh, the police has booked a resident of SAS Nagar for allegedly abducting his 18-year-old daughter Gurdeep Kaur. According to the police, the girl had failed in her plus two examinations thrice and had left a note behind stating that she was leaving home on her own. While there was no eyewitness to her leaving home, the SAS Nagar resident, a relative, had been booked as the girl’s father suspected his involvement.